Jenny Youngwith is the girl next door; an all-American blonde teen from the heartland who loves her family, her dog and most of all playing basketball. She is also developmentally disabled and suffers from a respiratory condition that requires her to breathe from an oxygen tank when involved in any activity more strenuous than sleeping. That tank weighs just four pounds and is carried by a trained service dog named Simba. Simba, a yellow lab mix, goes everywhere with Jenny: to class, to church, the swimming pool, the baseball diamond, even performing alongside her at a ballet recital, and even on the basketball court. At least in the beginning. "I like playing basketball," the 17-year-old high school senior told ABCNews.com. "I miss having the chance to play with my friends." 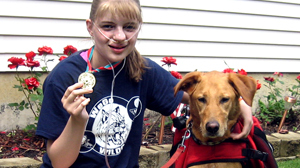 For six years Jenny has played basketball at a club at Northern Illinois University, with Simba at her side and a five-foot tube connecting her to the oxygen tank Simba carries on his back in a harness. More recently she's played during gym class at her school, also with Simba, and without problem or objection. "Simba is my best friend," Jenny said. "He lets me be more independent." So, when her public high school outside Chicago announced last fall that the Illinois branch of the Special Olympics would establish basketball and track programs there, Jenny jumped at the chance to wear her school's uniform and play with her friends. But Special Olympics banned Jenny from playing, in essence saying she was too special for Special Olympics. That prompted her parents to file a federal discrimination suit, demanding to know why their daughter was being sidelined. The problem arose when Jenny's school district entered an agreement with the Special Olympics, promising to abide by the organization's rules. That meant no court time for Jenny, though the organization won't say whether it's because of the oxyen, or Simba, or both. "She's been playing with the same kids at the school for years. We don't know the reasons she is not allowed to play now," said Jenny's mother Janice Youngwith. "We provided them with letters from her doctor, coaches, and parents. We even offered to put her oxygen tanks in a backpack." Banned from Special Olympics; But Why? The Youngwiths say the don't know why Jenny is not allowed to play, and the Special Olympics isn't giving them a clear answer. "While we cannot comment on the specific allegations made in the Youngwith lawsuit regarding the use of service animals and metal oxygen tanks by athletes during competitive sporting events, we hope the community will recognize Special Olympics Illinois must make decisions that take into account the safety and well-being of all athletes participating in its sporting events and practices," the group said in a statement. According to its Web site, Special Olympics, an organization committed to inclusivity and providing athletic outlets for people with "intellectual disabilities," services 21,000 disabled athletes annually throughout Illinois. Jenny has also been banned from participating in Special Olympics-sanctioned track events, even though her family said Simba runs alongside her in an empty lane. This summer she did participate in one Special Olympic event, winning a gold medal in the softball throw. "Special Olympics wouldn't allow her on the track. But she participated in a field event. She came home with a gold medal in the softball throw. She wore the medal for weeks. She loved the experience," said Janice Youngwith. Jenny's mother said it was a difficult decision to sue Special Olympics and Community High School District 94 in Chicago's far western suburbs, but she believed she had exhausted all her options. "We were so excited the Special Olympics had come to her school. We don't want to see them go. I want this resolved so she can get back on the court," said Janice Youngwith. "Special Olympics should be able to accommodate someone with special needs. If she doesn't fit in there, where does she fit in?" she asked. The Youngswiths sought the help of Equip for Equality, a disability rights group based in Illinois and filed a federal suit against Special Olympics and the school district. Jenny's lawyer, Barry Taylor who is the legal advocacy director for Equip for Equality, said the group filed a suit under the Americans with Disability Act and state law. The school district and Special Olympics Illinois, he said, denied her the opportunity to compete because of her disability and use of oxygen and a service animal. "In all respects," reads the lawsuit, "[Jenny] Youngwith is eligible and qualified to fully and safely participate in the SOI and School District basketball and sports programs with or without reasonable modifications and/or accommodations." Taylor said a special Olympian in Montana is allowed to play with oxygen tanks contained in a backpack. "The main thing is to get her a chance to play like everyone else. All she wants is to play," he said.